Beetroot, informally known as beet around the world, seems to be one of those vegetables that one either loves or hates. The rich flesh of this root vegetable is naturally sweet and nutritious, and adds its own touch to dishes ranging from salads to soups. The glycemic index of beetroot is 64 which falls under medium category. Since 1 medium sized beetroot contains only 7.4 g of CHO, the glycemic load is only 4.7. Beets are root vegetable, extremely rich in phytonutrients. One such type of phytonutrient found in beetroot is betalains which have proven health benefits and is responsible for the bright red color. Is Beetroot safe for Diabetics? The glycemic index of beetroot is 64 which is medium yet the glycemic load is 4.7. So beets may be included in the diabetic friendly diet for stable blood glucose levels. Beetroot have a distinct carbohydrate profile. It has more sugar than any other vegetable but still due to just 7.4 g of CHO and 3 g of fiber in 1 medium sized beetroot, its effect on blood glucose levels is modest. The amount of fiber in 1 medium sized beets (3g) helps in regular bowel movements and keeps the digestive system healthy. It is advisable to include beet in its raw form to avoid nutrient loss. Being an extremely rich source of dietary nitrates, beetroots act as vasodilators and helps in improving blood pressure. Is Beetroot suitable for Weight Loss? 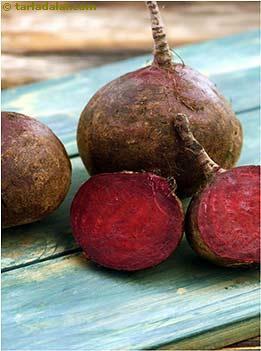 1 medium sized beetroot provides only 3g of fiber with just 37 calories. Thus serves as a special addition to the diet when looking to lose few extra pounds. When you eat food rich in fiber, it moves slowly through your digestive tract and helps you keep full for a longer period of time. This promotes satiety and keeps your appetite under control. Thus aids in low calorie intake. Try adding beets to your salad in its raw form to minimize nutrient loss.